Crabapples (Malus sylvestris) are small deciduous fruit trees that are indigenous to regions in Europe. They produce tart apples that are used in making jellies, jams and for pickling. Like other apple trees, crabapples need full sun and rich, well draining soil for best growth. Growing crabapples from seed requires a special process to interrupt the deep dormancy of the seeds beforehand. Cut open a fresh, ripe crabapple. Separate the seeds from the pulp of the crabapple. Place the crabapple seeds into a wire basket, sieve or colander. Run cool water over the crabapple seeds to remove any sticky residue or pulp. Set the seeds onto paper towels to dry overnight. Measure out approximately 1 to 1 1/2 cups of fine sand, or sphagnum peat moss. Place the sphagnum peat moss or sand into a bowl. Pour water into the bowl until the sand or sphagnum moss is moistened. Pour the dampened sand or sphagnum peat moss into a sealable plastic bag. Place the crabapple seeds into the plastic bag and seal it closed. Shake the bag 2 to 3 times to distribute the crabapple seeds into the media. Put the bag containing the crabapple seeds in a location where the temperature will stay at 60 degrees F. Leave the bag in the warm location for two weeks. Transfer the bag to a cold storage location after the two weeks has passed. The temperature needs to be at approximately 33 degrees F. Keep the bag in the cold storage for four months. Check on the contents of the bag once a week, mist the sphagnum peat moss or sand with water as needed to ensure the media stays moist. Fill up 3 or 4-inch plastic pots with a seed raising mix until each is filled to within 1/2 from the top. Firm the seed raising mix down using a small piece of wood, your fingers or the bottom of a glass. Poke 1 to 2 1/2 inch deep holes in the middle of each 3 or 4-inch pot using a chopstick or the blunt end of a pencil. Plant 1 crabapple seed into each of the 1/2 inch deep holes. Scoop approximately 1/2 inch of seed raising mix over each of the seeds. Transfer the 3 or 4-inch pots into a moderately warm location in your home, or outdoors if there is no more frost expected in your growing region. Try to keep the temperature between 60 and 75 degrees F. Provide eight or more hours of indirect light every day. Mist the surface of the soil in the pots with water as often as needed to keep the media moist, not dripping wet. Germination of crabapples can be sporadic, some may not germinate for as long as 12 months, according to Plants for a Future.com. Plan on starting the process for preparing crabapple seeds in November so you can plant the seeds in spring. 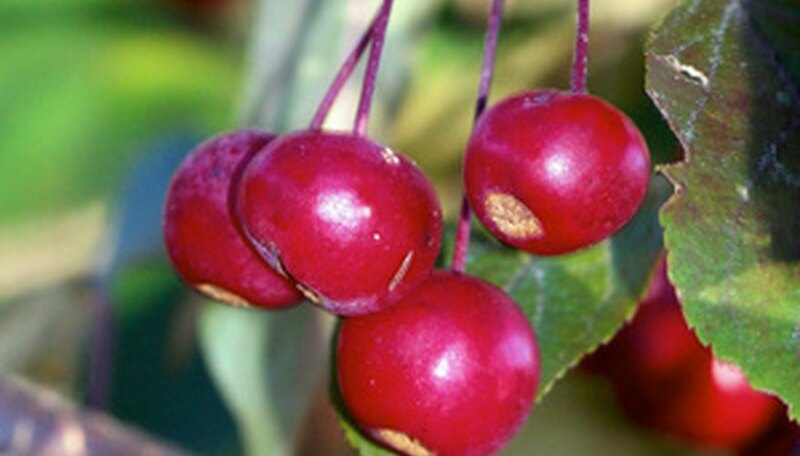 When planting crabapples from seed, bear in mind they will usually not grow true to seed.